She looks like she can be Kirby's sister who found a sphere that looks like candy. Can you try making Don Bongo for me? He's my favorite boss. Make him have an angry expression. 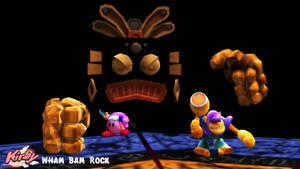 Can you possibly make models like this for Banjo-Kazooie, Conker, or Rareware? Looks awesome, but I still gotta ask since it's been a while - was this to match the original promo art for this character? Just wondering. Wow, looks just like the original render! I remember this guy! Easiest boss, EVER.